Like clockwork, the 2014 versions were released early this month as they are every year. 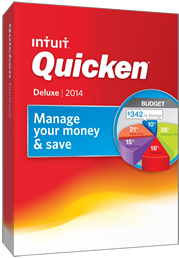 And just as last year, Quicken 2014 (now available at quicken.intuit.com for $10.00 off!) continues to reign in helping individuals in managing finances and making more informed decisions. 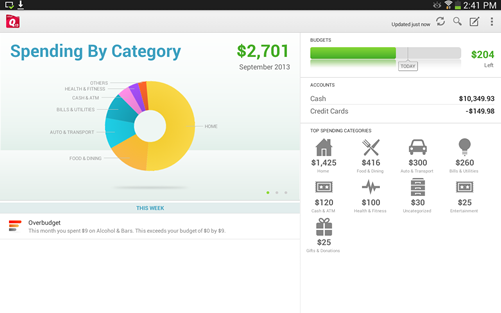 Although there have been more alternatives in the recent years, Quicken still leads the pack offering a detailed, uncomplicated, and powerful software to get a clear picture of your finances today and into the future. This latest version of Quicken is mainly based on improvements in functionality of the commonly used features and takes another step into mobile capabilities. As more transactions are performed on the go, Quicken Deluxe 2014 is adapting to provide larger number of desktop capabilities on tablets and smart phones. 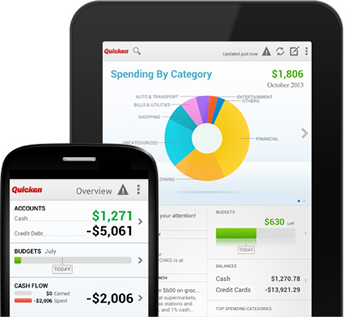 Quicken 2014 for Windows comes with a free mobile app that syncs information between a desktop, tablet, and smartphone. It displays your balances, transactions, or alerts you if a balance on any of your accounts falls below certain limit. Transactions entered on a wireless device are updated across all portals you use. Additionally, you can take photos of receipts, statements, check images, photos and other documents and tie them to a particular transaction. This way they are always handy and you don’t need to worry about misplacing them. Starting this year you will see payment reminders in Quicken register. Email reminders are great but sometimes they get lost in all the information we receive electronically. Having bills due right in the register allows for more efficient action, as the register is one of the most common features Quicken owners use. Not to mention it is a useful addition when planning for future cash flows. The biggest change to this feature is that instead of manually entering bill reminders, they can be displayed automatically providing an immediate effect on your balances as far into the future as you want. Although there aren’t many new features in this latest release of Quicken, it may be a glimpse of what the next step for the software developer may be. With greater number of app-based devices in use and growing importance of smart phones, Intuit is steering towards phone and tablet versions of the software. I wouldn’t be surprised to see Quicken 2015 to provide more features currently available only on a computer version on portable devices. How do I upgrade to Quicken 2014? Switching to Quicken 2014 is rather uncomplicated as the software handles a transfer of your information from an older edition. Opening a backup file in the new version should work automatically. There is also no need to worry about removing the older version of Quicken as the software does it for you before the new version is installed. If you decide to upgrade to Quicken 2014 from one of the most recent versions, there won’t be a problem in file conversion. If you haven’t updated you Quicken version in sometime, refer to the following list of what steps to take to convert any older version of Quicken to Quicken 2014.